This week is just flying by....started slow for, about two hours and then I got bombarded with training requests and baking orders. Small things taking a long time and I was started to wonder if I was going to post these on time for the party. What party? My baking pal, Peabody is hosting a virtual housewarming party at her new and gorgeous abode next week. I thought long and hard about what I wanted to bring. Needs to travel easily (which can be easily done with this), needs to feed a bunch of people because from the look of things we are going in numbers, but most importantly I wanted to make something for her. Although she never fails to surprise me, I think pumpkin and mascarpone are sure values with this lady. Since we also seem to share a love for all things small, cupcakes seemed like a good way to combine both in one sweet treat. Preheat oven to 350°F. Place baking cups in muffin pan. Cream butter and sugar until fluffy. Add eggs, one at a time, beating well after each addition. 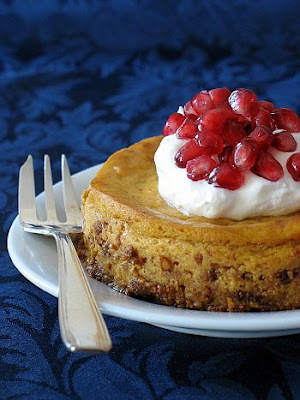 Combine pumpkin, vanilla extract and milk in a separate bowl. Mix flour, spices, baking powder, baking soda and salt in a bowl. 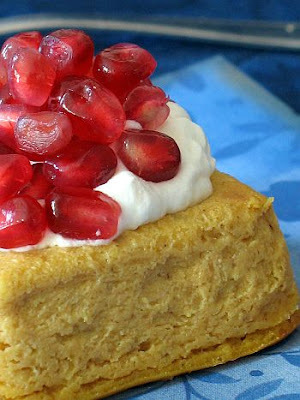 Add to butter/sugar mixture alternately with pumpkin/milk batter, mixing thoroughly after each addition. Divide evenly among the cupcake liners and bake 20-30 minutes or until a toothpick inserted in the middle comes out clean. Let cool completely before frosting. In an electric mixer, beat butter and cream cheese at medium speed until creamy. Add 4 cups of the powdered sugar and vanilla. Beat until combined. Add more sugar, little by little until you get to the consistency and sweetness you like. If the frosting gets too stiff, add some milk, one teaspoon at a time. Not only are we going to enjoy warm out of the oven, but I am also bringing them to Jeanne, who is hosting this month Waiter There Is Something In My....Tart! I made these for the first time years ago at the restaurant a few days before Thanksgiving. I had to make the usual required pies for T-Day but I was really itching for a change. Everybody was getting in the holiday mood and I thought a little cranberry dessert would be a good idea. For some reason, our produce guy had misunderstood our order and we got twice the amount of cranberries we needed. The chefs dropped off a box by my pastry kitchen with a little "Have Fun!" sticky note on it. Their idea of a good time...ahahah!!! Same guys who loaded me with two crates of pears one day and I ended up re-writing the book on pear dessert! I digress, sorry. Well, I looked around the kitchen, closed the door behind me in the walk-in cooler for a few minutes (my best thinking place), and took out the shortbread tart dough I had made that morning and figured I would make a tart with them. Question was: which one? Can I be trusted with cranberries? After all they were not part of my culture growing up and I had only had them in cranberry sauce with turkey. Mmmm...I emerged from the walk-in and found a book on my prep table with another sticky note, this one from Old Chef "It's in here and it's good". Got to love those guys! He knew I was starting to struggle with the "Tart of the Day" on the menu. 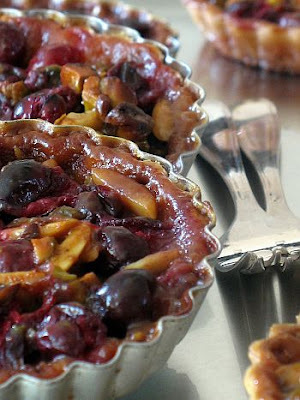 I thought I had a brilliant idea with that one: using only fresh produce to come up with a different tart every time. Different doughs, fillings, fruits, toppings, but other time consuming desserts on the menu were taking my attention away from the tart. The book in question was appropriately named The Book Of Tarts by Maury Rubin, and I believe it saved me from boredom and a few of our regulars from another Pear or Banana tart! 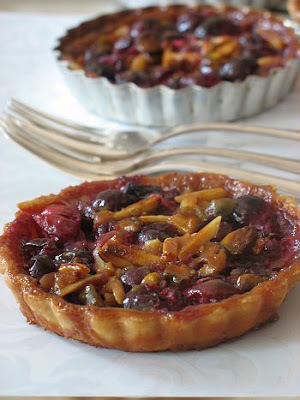 The book is a treasure trove of tarts, tartlets and other inspiring recipes. The recipe in the book uses sliced almonds but I wanted little festive look and used half the amount in pistachios and the rest in slivered almonds (what I had in hand). Feel free to use your favorite nuts, I have tired several combinations over the years and they never turned out bad. The caramel part can be a little tricky for new bakers but if you watch your pot carefully there should not be a major need for firefighters. It starts with a dry method caramel in which you had cream and butter. 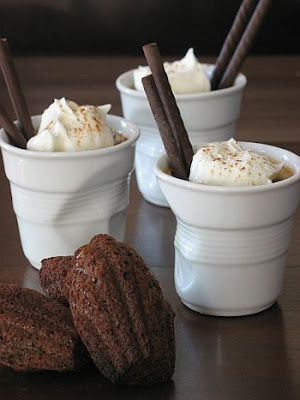 Baby your sugar so that it does not burn and be careful of splatter and bubbles when you stir in the cream and butter. If the mixture does not appear smooth, put it back on the stove and stir slowly until it becomes smooth. 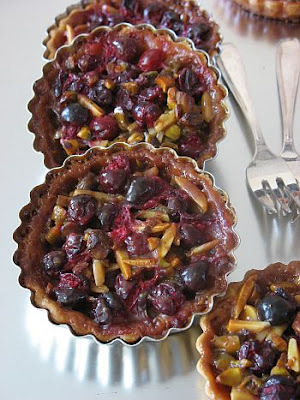 Cranberry Nut Caramel Tarts, adapted from Maury Rubin. Makes 8-10 3 inch tarts or one 9 inch. Let the butter sit at room temperature for 15 minutes, until malleable. Place the powdered sugar in the bowl of a standing mixer. Add the pieces of butter and toss to coat. Using a paddle attachment with a standing mixer, combine the sugar and butter at medium speed, until the sugar is no longer visible. Add the egg yolk and combine until no longer visible. Scrape down the butter off the sides of the bowl. Add half of the flour, then begin mixing again until the dough is crumbly. Add the remaining flour and then the cream and mix until the dough forms a sticky mass. Roll out the dough and cut out 8-10 6inch circles, fit into your 3 inch tart molds (or 9 inch tart pan), trim away the excess. Line with parchment paper and fill with dried beans or pie weights and bake at 350F for 10-15 minutes until golden brown. Measure the cream and butter into a saucepan and heat it over low heat. When the butter has melted completely, remove from heat. To make the caramel, spread the sugar evenly in a perfectly dry, deep 10-inch skillet and place it over medium-low heat. The sugar should turn straw-colored, then gold and then a nutty-brown caramel after about 10 minutes. If the sugar cooks unevenly, gently tilt or swirl the pan to evenly distribute the sugar. Remove from heat and slowly whisk the cream and butter into the sugar, which can splatter as the cream is added. 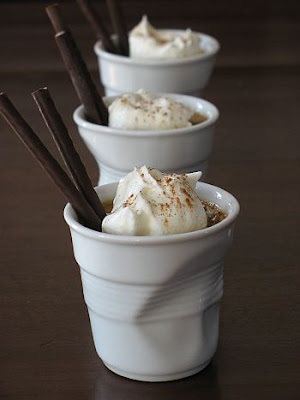 If the caramel seizes, return it to the heat and continue to stir until it is smooth and creamy. Strain the caramel into a bowl and cool it for 30 minutes. Stir the cranberries and the nuts into the caramel and mix until all the fruit and nuts are coated. Spoon the filling into the partially baked tart shells mounding toward the center. Bake for 20-25 minutes, until the juices and the caramel are bubbling slowly around the edges. Remove from the oven and let stand for 1 hour. Although Thanksgiving is not a holiday I grew up with, I wanted to write down a few things and people (you know who you are. I am probably IMing with you too) I am thankful for. * I am thankful for my family, who often times closes their eyes on my silliness and loves me no matter what. *I am thankful for love, the kind that gives your step a skip and makes your hiney tingle at the same time. *I am thankful for my health (beside a tooth that needs fixing), which helps me push the envelope a little more each day and discovering that I can put my body through 2 hours of BootCamp training and still have enough energy to make a cake and dinner. * I am thankful for my readers whose words are not received as praises but encouragement that I am writing in the right direction, that I am on the right track in telling them to get in the kitchen and bake! Thank you all for all your emails, questions, keep them coming eve if sometimes it takes me a long time to reply. Not one to particularly toot my own horn, I am ecstatic that these little buns make my blog look good! 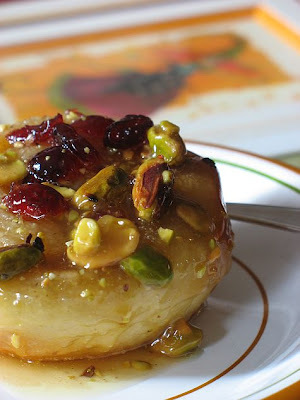 Yes, I know you have already seen these pistachio and cranberry sticky buns back in September for a Daring Bakers' Challenge. 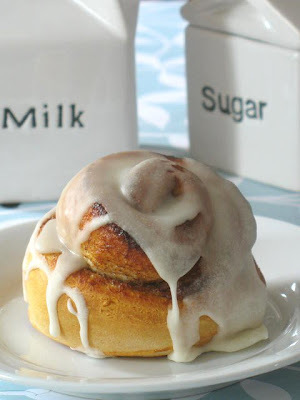 Well, these little sticky gooey goodness of buns won me the Edibility Category in the latest edition of Does My Blog Look Good In This, hosted by Jennifer from Bake or Break. Thank you to the judges and of course to Marce for picking up the recipe in the first place. It's interesting how life comes at you full force, sometimes from people you don't even know. 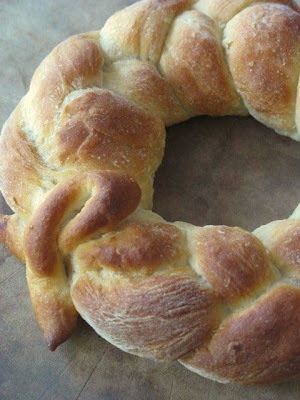 A few weeks ago one member of the Daring Bakers, Inge, posted an event she was hosting to honor the women, be it moms or grandmothers (or any person special to us) who influenced us in the kitchen. The event, Apple and Thyme, was somewhat prompted by the fact that a blogging friend of hers, Jeni from the Passionate Palate, had just lost her mother to a long battle with cancer. Losing is the right term when it comes to loved ones, especially mothers. You lose a bit of your essence, a small part of your flesh is ripped and your heart is taken away from away from you. The hurt and the pain diminish with time but never really go away. I am sorry that Jeni had to experience such a tragedy. I often think about the pain my own mother must feel day in day out after losing her own mother and it just breaks my heart. I can't think about a day without my mom, even though we do not talk on the phone everyday or even when sometimes we don't really like each other (hey, we all have our moods!). Jeni, I offer you my deepest condolences and thank you for reminding me to hug my mom, even if only in my dreams. If you have been reading this blog for a while, you know how deeply my grandmother has influenced my baking. She had that magical touch...you would come to visit and within half an hour the table was set with a wonderful spread of foods. It seemed almost effortless to her to come up with the most delicious foods. I used to believe my grandmother was this goddess of the kitchen, even when she was too frail from battling cancer. It's not that I thought less of my mother's cooking and baking, don't get me wrong, but I felt like my mother was showing me the ropes, the behind the scenes, while grandma was giving me the picture perfect, no mise-en-place necessary final product. My mother is more of a cook than a baker but when she tackles the dough, man! She is good! Just as good as her own mother and I hope I am up to par with their talent. Most French house cooks and bakers do not make elaborate 5 courses meal or produce 3 layer mousse cakes every day of the week. We make yogurt cakes, chocolate mousses, clafoutis, flans, and tarts....lots of tarts!! I think the first item I ever baked was a tart, maybe a quiche, something with a crust, something with a filling, something with cream....and I got hooked, hence the blog name "Tartelette".... There is always a tart of some sort in the fridge...no lie. Well, except tonight because I finished the last slice of this one. 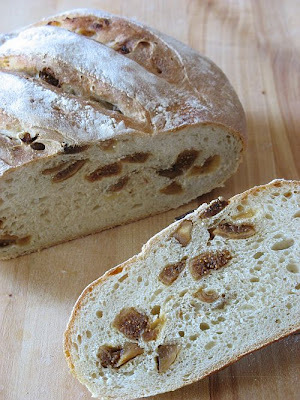 I love the contrast between crust and filling, the endless possibilities of ingredients combination. If a tart had a cousin, it would be a salad: both can be as rustic or elaborate as you wish, both can make a meal (savory tart) or a side, both make use of seasonal produce or what is overripe in the fruit basket and both adapt to a myriad of cultures and cuisines. 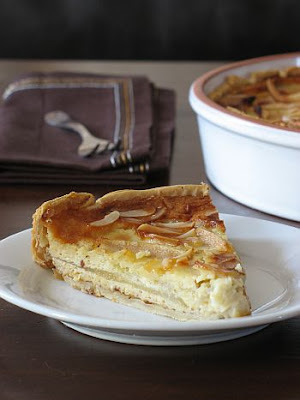 For this particular tart to pay tribute to both my mother and grandmother I have chosen one of our favorite combination: pears and almonds. I miss you grandma and mom, and hope I make you proud everytime I step in and out of the kitchen. Makes one 10 inch tart. Preheat oven to 350F and blind bake the tart shells: roll the dough out on a lightly floured surface, lay into tart shell, cover with parchment paper or foil, pour dry beans or pie weights on top and bake fro 15 minutes. Let cool before proceeding. In a large mixing bowl, whisk together the eggs and the sugar until pale. Whisk in the ground almonds, milk and cream. Pour into the cooled pie shell, leaving about a 1 inch border so that the batter does not overflow when you arrange the ears on top. 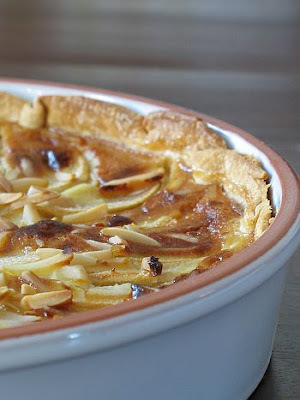 Arrange the pear slices over the top and sprinkle with the slivered almonds. Bake at 350 until golden brown, do not worry if it still wiggles a bit in the middle, the custard will keep on setting once removed from the oven. Serve warm or at room temperature...oh heck! Eat it anyway you want, it is darn good even cold!! I wanted to post this yesterday but somehow I kept starting over and over again, never satisfied with the angle I chose to tell you the story behind this dessert....the post itself is as deconstructed as the dish itself, much like the great story that goes along with it. So forgive me if this post has "ni queue ni tete" (literally "no tail nor head"). How did this dessert come about? If you have been following this little blog of mine this summer, you have read me say that the house was constantly filled with guests, good times, laughter, good eating and of course good drinking. The hotel Tartelette is now empty and it feels somewhat strange to have an evening by myself, starring at the dog who has been spoiled with so much petting! Our last guest was my very bestest friend Tim, aka Trouble coming to enjoy the last bit of sunshine before he'd have to face the cold weather of Cincinnati. We met while working at the same restaurant downtown. As the pastry chef, I always had the waiters try the special dessert of the day or refresh their memory with an item from the current menu. The rest of the kitchen crew used to love to butthead with them and I figured I could bring a little TLC with a bite of chocolate cake. Well, under Tim's lead, there were a few of them endlessly coming back for seconds, which always resulted in getting me in trouble with the rest of the kitchen crew, hence his nickname. They were worse than a group of women on Midol with their sweet tooth, but what was I to do in front of killer smiles and batting eyelashes?!! We became instant friends, that was over 7 years ago and we have remained thick as thieves ever since. He's seen me happy, in love, upset and has always lifted my spirits up. The first time I met him, I found him rather...hmm..how can I say?..."deconstructed"? He thinks a million thoughts a minute, has many interests in completely unrelated fields, he's been all over the place, and it seems that between the two of us, we are making a point at trying every job under the sun!! I have to add that it seems that we are both growing up lately and "deconstructed", although never a derogative term for him, is less of a personality trait these days. Ok, still nothing that relates to the Deconstructed Coconut Cream Pie of this post...well...Now I am getting to it. Between the appetizers and desserts, our waiter brought us a little palate cleanser: a tiny scoop of strawberry-kiwi sorbet....plated in the same cups you see in the pictures. All our dishes were brought forward in the most beautiful, so-great-for-blog-posts dishes that I wanted to keep several. I hung on tight to my little sorbet dish (per Trouble suggestion) thinking the waiter would forget about it but alas he removed it when I reached for my wine (darn French me!)....B. suggested we asked if we could purchase a couple for my blog, pictures, etc...brilliant! I asked how much they would charge me for one set and when I heard "5 bucks a piece", I exclaimed "Pack me up 3 please!!". Since Tim almost got me in trouble (I am telling you) for keeping one, he bought these for me as a hostess gift and a pack of Haribo strawberries for B. for almost putting his lovely Tartelette in jail!! 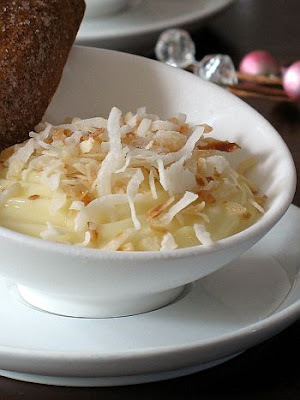 To properly thank Mr. Trouble for making my blog look good, I wanted to make one of his favorite desserts, coconut cream pie using my new dishes and I thought a deconstructed version would work best in this case. I did not have the chance to do it before he left, so it is a virtual taste for him, sorry! The recipe makes more than my three little dishes, so I assembled a larger one and took it over to the neighbours. If you know me a little from this blog, you have read me mention that B. can't stand coconut, the shreds, not the flavor....so guess who was left to enjoy these....me, once again getting me in trouble with my skinny jeans and my love/hate relationship with the treadmill. Sheeesh...! 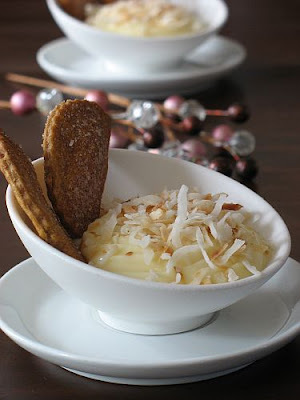 So after what is the longest post in the history of Tartelette, I give you Tim's Deconstructed Coconut Pie...Enjoy!! In a medium saucepan, combine half-and-half, eggs, sugar, flour and salt. Bring to a boil over low heat, stirring constantly. Remove from heat, and stir in 3/4 cup of the coconut and the vanilla extract. Pour into serving dishes and chill 2 to 4 hours, or until firm. 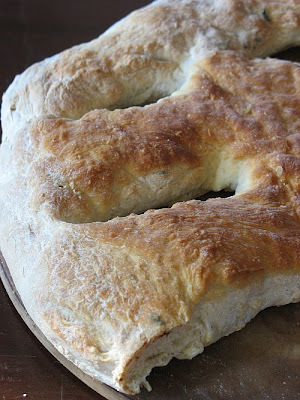 In the meantime roll out the dough to 1/8 inch thick, with cookie cutters , cut out different shape. Lay them flat on a parchment lined baking sheets, sprinkle with the sugar and bake at 350 F. until golden brown (10 minutes). When ready to serve, sprinkle the remaining coconut over the dishes and stick a couple of dough shapes in them. Nothing much going on in the kitchen right now as my work life as taken a somewhat unexpected turn. Well, ok, I knew changes were coming, I was not sure of the timing so it's been a pretty stressful week to say the least. I did fulfill the orders I had for cakes and other desserts but that's about it. 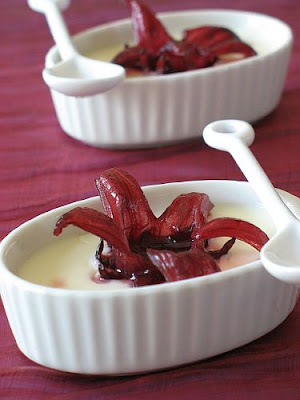 What I did find time to do was those little ramequins of white chocolate pots de creme (cream pots, literally) adorned with dried hibiscus flowers. When I visited Lisa a couple of weeks ago, I asked her (ok, begged) to take me back to Sur La Table and Trader Joe's to get the few things I had noticed from my previous trip there. Among the items I was coveting were those little ramequins (about 3 inches long and 1.5 inch wide) and dried sweetened hibiscus flowers. Why? Because both were pretty ad would photograph well, and I was curious to the taste of the dried fruit. B, brought back a large supply of the dried buds to make tea from a previous trip to Egypt and I fell in love with the deep red/pink color as well as its slight tart taste. Turns out the flowers taste just like dried cranberries....yum! For more elaborated posts (and because no one tells a story like Lisa) about Mary's and my trip, go to Lisa's blog where you will get the full report of our adventures. One evening last weekend, while we had company over ( and boy, did we have fun), I was craving the comfort of white chocolate. Yes, I admit it, and chocolate purists can throw a stone at me, I like white chocolate. 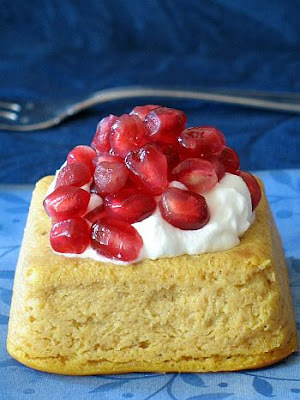 Can't stand to eat it on its own, but I love incorporating it into desserts. The guys had plenty to munch on, brownies, cake....but I needed white chocolate...I needed soft and creamy and I needed a perk of flavor and tartness. So while the boys were grilling, I started the creams and by the time we were getting cozy on the patio with coffee, the creams were ready! While a little on the rich side, the ramequins are small enough to provide the perfect 4 bites serving. Wait until serving time to set the dried hibiscus flowers on top or they will start to bleed after a couple of days in the fridge. The verdict? Well, we fought over the last one...that should tell you something! Combine the cream and milk in a heavy bottom, 2 quart saucepan. Place over medium heat and bring to a boil. Bring the water in a double boiler to a simmer. Place the chocolate in the top half and stir with a rubber spatula until melted. Whisk the egg yolks into the melted chocolate. Slowly pour the boiling cream mixture into the chocolate, whisking constantly. Bring to a temperature of 160 degrees, about 3 1/2 to 4 minutes. Remove from the heat and transfer to a stainless steel bowl. Cool in an ice bath, stirring constantly with a wire whisk to a temperature of 90 degrees F., about 4 to 5 minutes. 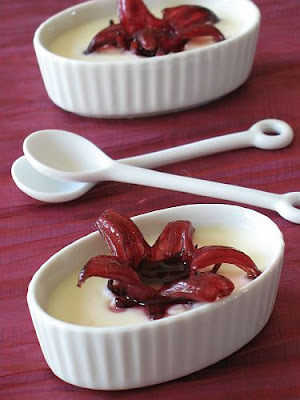 Evenly divide the mixture into 8 small pot de creme forms or glass custard cups. Cover each with plastic wrap and refrigerate for 2 to 3 hours to set before serving.